The launch of your website can be the biggest digital marketing expense to budget for, but be careful not to get caught with unbudgeted site update needs. Websites need updates for a variety of reasons, from changes to your brand, products, or services, to changes in technologies like search engine algorithms and cyber-security. I recommend a detailed comb-through of your website at least annually and complete professional updates every two to three years. If you budget for annual website updates, you can rest assured you’ll have a site that stays current with technology and reflects your company’s evolution. 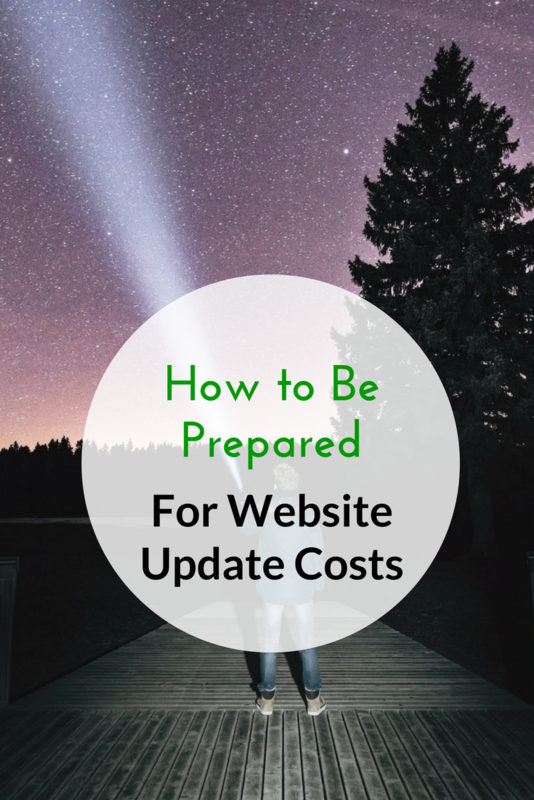 You’ll also avoid any surprise maintenance or website update costs. How do you know when it’s time to invest in an update? Here are some things to look for. Your business will evolve. Your website needs to keep pace. Any new products or services call for new pages to be built into your site. Similarly, any move into a new market segment or geographic location needs to be backed up by new pages. Pages that are specific to new products and markets are essential to driving the SEO that will give these initiatives online visibility. Branding changes such as an updated color scheme or logo will call for a more global site overhaul. It may be a small change to each page, but it’s important that your entire site uniformly reflects your most updated branding. When Google announced an algorithm shift in 2015 to weight websites that are mobile-friendly higher than those that aren’t, it spurred website owners worldwide to update the way their sites display on mobile devices. Sites that weren’t mobile responsive before the change became mobile responsive after it. It was a technology sea change that really demanded a response from website owners. Search engine algorithm shifts are rarely that earth shattering, but they are likely more frequent than you realize. Keeping your website current with these updates will preclude any surprises in your search engine rankings. Another area of technology to keep up with is security. Reputable website builders like Wordpress and Squarespace do a great job of keeping their content management systems secure. But it’s important to periodically ensure the security of any third-party plugins your website has installed and the status of your SSL certificate. Another reason to update your site? It’s not generating the leads you expect. An underperforming site is a symptom of landing pages, calls-to-action, and contact forms that are not grabbing visitors’ attention. Adjust the look, placement, and wording of these elements to improve your results. Depending on the number of landing pages you have, this could be a large update or a small tweak. It’s worthwhile to continually improve these lead-generating elements by testing different tweaks and refreshers. Updates to your website won’t be as pricy as the initial build, but they are a factor to add to your marketing budget. Expect your digital marketing company to charge a flat fee for an update with a well-defined scope of work and an hourly fee for a more general or less defined update. Be in touch! We will work with you to keep your website brand aligned, SEO optimized, secure, and meeting your lead-generation goals. Breezy Hill Marketing is a Vermont web design company offering digital advertising strategy and execution, responsive web design, inbound marketing, and social media marketing for clients throughout the United States. We work closely with our clients to craft strategies specific to their needs.